Don’t hesitate to contact us by email, and stay connected via Facebook and and LinkedIn. The main objective of this technical assistance was for OCTA and the OCTs to have a good understanding of the process and main options discussed in the framework of the future of the Cotonou Partnership Agreement (CPA)after 2020, with a view to defend their interests in the formulation of post‐2020 policies and legal frameworks. The specific objective was to produce a strategic paper to guide the reflection of OCTs on major aspects of the post 2020 debate, notably the post‐2020 framework that will impact the EU‐OCT partnership; how OCTs can influence the post 2020 debate; and reflect on future modalities of funding for OCTs. The team of consultants provided OCTA decision makers with a document with the necessary information to guide their discussions in formulating the OCTA position on the various facets (model of cooperation, areas of cooperation, mode of cooperation funding etc.) of the post-2020 debate. 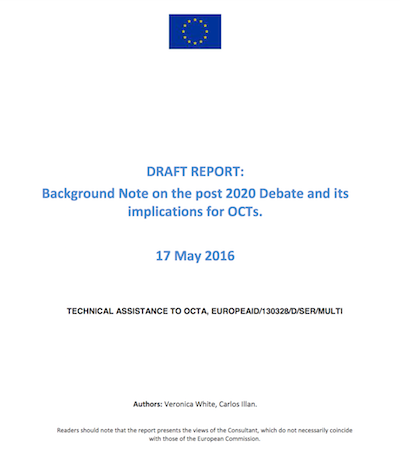 Background note on the post 2020 Debate and its implications for OCTs. In addition to its in-house team, VJW International partners with a strong network of external experts to provide the highest level of quality to its projects. Click to discover our team. email contact@vjwinternational.com , and stay connected via Facebook and LinkedIn.